We are starting to see a shift in the market. Although the economy is still improving and house prices are still rising, the pace at which houses sell is starting to slow down due to the rising interest rates. This will continue. But it means that it will cost buyers and sellers if they do not act now. It is all about BUYING POWER for buyer, which effects sellers! Every month that passes, buyers and sellers are loosing money! And here is why and how much. The chart below shows the impact of rising interest rates on buyers. In my previous blogs you may have read that the cost of home ownership has risen by about 10% since late last year. Here are the details … We are comparing last year with an interest rate at 3.83% to today at 4.72% and the predicted rates of next year at 5.61%. For simplicity, we choose an annual income of $100,000 with 10% down payment. The bank has a ratio at which it calculates the “Qualifying Monthly Expense” – usually around 35% of the income. At 35% with a 100K income, the total allowable monthly payments would be $2,917 in any rate environment. ($100,000/12 x 35% = $2,917). If we deduct the property taxes, insurance and PMI (below 20% down payment), a buyer is left with around $1,850 for the Debt Service Payment (Principal and Interest). Now it gets scary… In late 2017 at a rate of 3.83%, that Debt Service Payment was able to cover a Qualifying Mortgage Principle of $389,799. As rates rose that principal is getting smaller and smaller. Add the 10% down payment, a buyer, who was able to buy a house up to $433,000 in 2017 is now only qualified only up to $395,000 and in 2019 only up to $362,000. 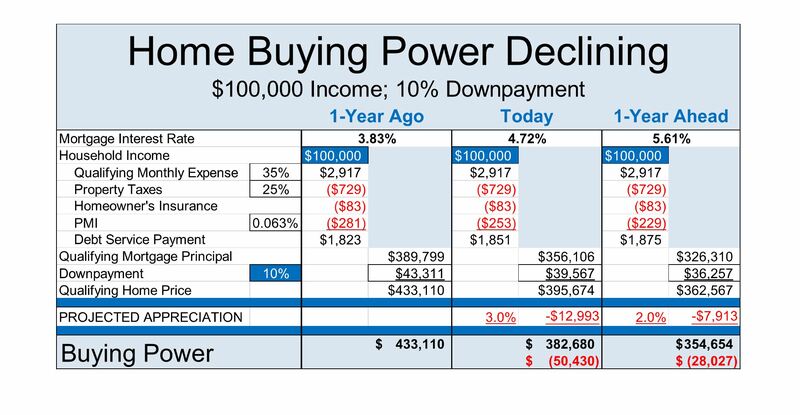 Consider rising home values of 3% in 2018 and 2% in 2019, today’s buyer lost over $50,000 in buying power (or 11.5%) compared to last year. That buyer will lose next year another $28,000 (7%). A house purchased in 2019 will be 18% more expensive as if it was purchased in 2017. Should or do buyers wait? No! … Don’t forget the improving economy I mentioned earlier and combine that with the increasing home values due the lack of inventory – even if the sales pace is slowing down. Economists say that the next correction may occur around 2022. But this will be nothing like the great recession we experienced in 2006/7. We will be slowing down gradually this time, and tip over slowly as well. Towards the end of each correction cycle, a stimulus is introduced, usually in form of drastically reduced interest rates. That would mean, a buyer would have to wait for 6-7years until 2023/24 to buy a house at the bottom of the market. The buyer who acts now will immediately benefit from rising home values, from paying down principal, from tax deductions and not to mention from the desired quality of life as a home owner. Ever since the FED announced the certainty of rate hikes, the time to buy is now. Buyers need to make more concessions on the wish list due to the lack of available inventory. List soon and price right! Buyers will be more and more price sensitive. Multiple offer will happen less and less and proper pricing is crucial. No “testing the market” when listing a house. Statistics in NJ show that a house priced right will achieve 99-100% of its fair market value. But the same house priced 3% or more higher, will need to drop the price at least once, which will create more bargaining power for the buyer, who looses the urgency, and this will result a lower sales price and in less money into the seller’s pocket. Houses that show well and are priced right are still achieving the highest market price. While a low inventory will continue to put pressure on prices, rate conscious buyers will slow down the sales pace, making it for sellers more difficult to sell in the future as interest rates increase until buyers start pulling the brakes.